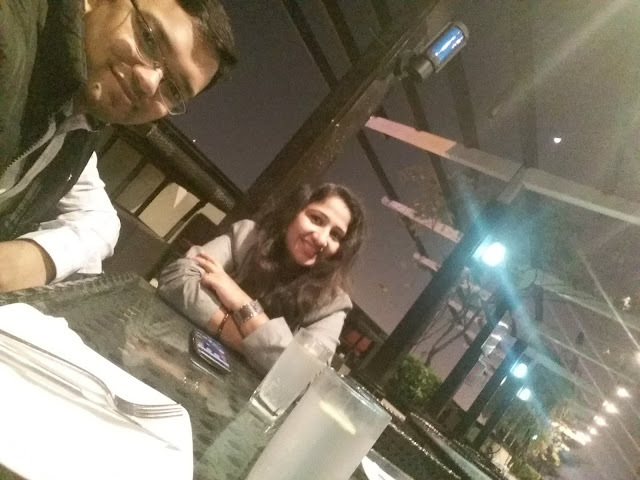 Winters were gradually setting in the evenings had become pleasurable and we thought it was the perfect time for an open-air terrace dinner at one of the places. The usual search led us to this place called - The Sky Lounge. I had been there earlier for an office party but then we had the entire terrace booked for us along with DJ and music so the experience was altogether very different. Well, as planned we were there at the restaurant lobby on the evening of 6th December excited to try out the place and have some quality time. The restaurant is part of Park Plaza Hotel and is on the terrace of 14 story building. We took the elevator to the terrace but were surprised to see complete darkness with no attendant in sight - a pretty baffling sight I would say. We looked around and finally realized that there obviously was no one to help us out and we approached the bar to check whether the place is even open. The bar attendant was the only person on the terrace and he asked us to take any seat - all were open and available. As we seated, we wondered if we had made a right choice or should we move to another restaurant. Well, (un)sanity prevailed and we decided to still give the place a shot. after about 20 minutes of waiting for, the bar attendant came with the menu. We picked our drinks and he recommended that we order the food right then too. We obliged and placed the entire order right there. The guy disappeared after the order and we were there all alone on the terrace to enjoy the view and setting. No doubt the setting was good with a terrace pool neatly done and lighting (put on after the order was placed) nicely giving the place a cozy ambiance. After about 40-45 minutes the same attendant appears with our drinks and promises to bring our food soon. As we sipped on the drinks we did realize that we were at the wrong place. Another 30 minutes of waiting for the food confirmed the notion. Finally, the food arrived and we had whatever we felt edible about it. The mood was already ruined and the ambiance was not enough to compensate for lack of service. We finished the meal and asked for the check. Now started another round of mismanagement. The guy asked us to accompany to the hotel reception for billing. We obliged again and followed him to the reception. We were asked to wait and he disappeared apparently in the ground floor restaurant. Another 15 minutes and he appears with the check and I hand him the card, ready to get out of the place as soon as we could. Suddenly I realized that there were duplicate items on the bill. Appalled, I asked him to recheck the items and he went to bring an updated check. I was dumbstruck with the error - we were the only one in the entire restaurant, he was the only server; there were 5 items in all and in that limited scope he found an opportunity to offer a wrong bill - that is after all the (lack of) service. Whatever it was, we paid our corrected bill and left. Overall the place has a good ambiance and set up but fails pretty badly in terms of service. No one is ready to attend and no one actually cares if you are there. Better avoid the place if you can or go there for an office party where you can book the service to your liking.